Does your phone try to autocorrect with absurd substitutions? Mine constantly thinks I want to say, “Yo,” instead of “You” and “Your.” Why is that? I mean I know for a fact my phone listens to me. On Tuesday night I told Nate, “If you help me get those bricks for the garden, I’ll take you to Sonic.” The next time I opened Instagram there was an ad for Sonic. I’ve never before seen an ad for Sonic on my phone in any format. So I know it listens to me, but I don’t go around the house saying, “YO! Adrian!” Well, not that much anyway. So why the “Yo?” It also has started to think that I prefer to communicate exclusively in emoticons. As if when I type the word “cash,” what I really want is to insert a little bag of money. How do I make it stop!?!?! Even though it is very sweet that Will loves to text with me, once in a while it can rub me the wrong way. Sometimes I feel like responding, “Dude, if there was anything of import going on, anything of the slightest value from an entertainment perspective, anything that would lift your spirits or be in ANY way worth your time, I would text you.” I mean sometimes I’m just unloading groceries or vacuuming up the baseball mud that somehow travels to every square inch of the house, it’s just not text-worthy. Here’s the exchange from last Monday. I didn’t misspell laundry, by the way. The stupid phone really thought I meant pain instead. But here’s the thing. 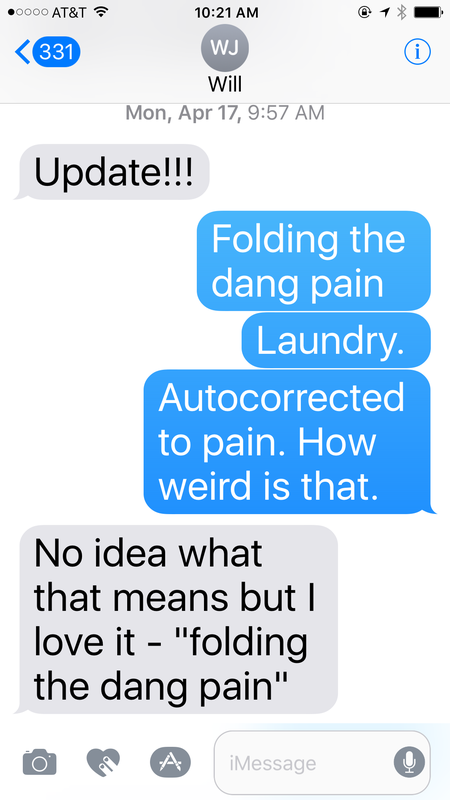 Do you have any idea how much mileage we’ve already gotten out of “Fold the Dang Pain?” Eleven days out and it’s deeply entrenched in our lexicon, and we cannot say it without laughing. You may be wondering how this has anything at all to do with the vision of this blog, which is to spur one another on to greater love and good deeds. But there’s actually an underlying principle here that’s vital: Remember. It is easy for me to remember funny things that happen and relive them ad nauseam. It is less natural, but more important to continually remember and remind myself of even the most basic truths of God’s Word. A few months back I printed out a two-page list of verses that remind me of who I am. I have the list tucked in my Bible, and reading through it is an invariably fruitful endeavor. How do you systematically remind yourself of who and whose you are? I hope you are well. In a roundabout way and a few days after Ash Wednesday, I decided to give up my Jackson Five posts for Lent. My family did a better job this year, than we ever have in the past, of observing Easter. Everyone gave up something for Lent, we attended some beautiful Holy Week services at church, and we watched The Passion as a family (until it was entirely too much for Sam and at that point we let him play mid-week NBA 2K instead, which is usually forebidden). I posted here on my blog 36 different readings or devotionals, falling four short of my goal. But mostly the whole season felt slower and more reflective than usual. We have a long way to go, but I feel like this year we moved in the right direction for preparing our hearts to celebrate Jesus’ victory over death. That said, I look forward to my Friday indulgence and have missed posting. Oftentimes I would think, “Oooh, I’ll have to blog about that,” then I’d remind myself that I’d given it up. But I’m back. And I wish, probably like you, that every week would just be one fun little story after another. But we live in a fallen world. And every single day horrible things happen. This week has been full of sorrow for many in our community because a boy named Jackson from Dub and Nate’s school disappeared in the Grand Canyon last Saturday. The intense search from the first days has been scaled back and it will be a miracle if they find him. But it seems all of Chattanooga is praying for this family, for the safe return of Jackson and his step-grandmother who is also missing. Various area schools have worn all blue to show solidarity in praying for Jackson. Opposing sports teams have prayed together after the game, begging God to bless this hurting mama with a tremendous miracle, an earthly reunion with her beautiful, beloved young son. This tragic situation makes me feel sick to think about and reminds me of another beautiful, beloved young boy who was swept away in a flash flood a few years back in Northern Virginia. Sometimes the sorrows of this world are unrelenting. We may find ourselves oscillating between rejoicing and mourning as we go through the day. While it can feel emotionally draining, it’s always great to know we are aligned with the Word of God. So, my friends, do not tire in doing good: Rejoicing with those who rejoice and mourning with those who mourn. 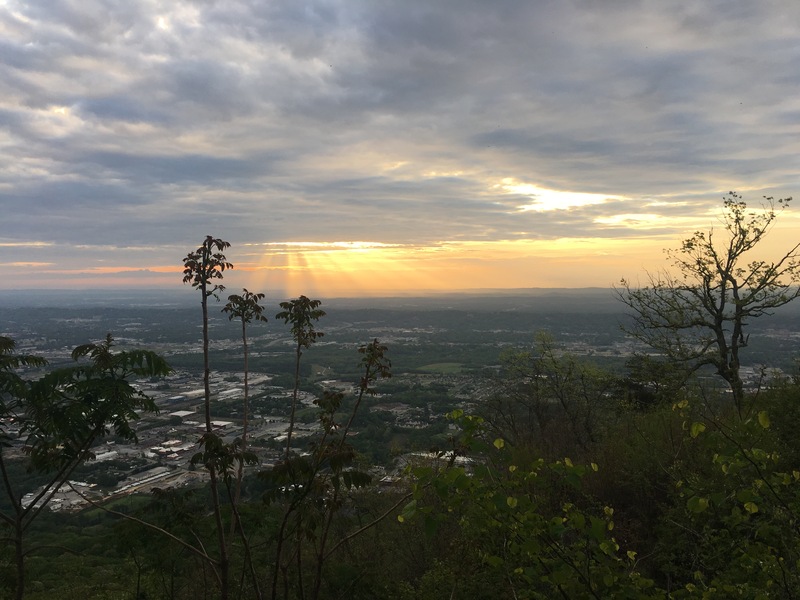 I hope this morning you can “Stand in triumph, stand in triumph, [and] worship Christ, the Risen King!” Although we have lived in Tennessee for sixteen months now, last year we were visiting family, so this is our first Easter on the mountain. It has been the sweetest celebration of Christ’s victory over death. From Palm Sunday, to Maundy Thursday, Good Friday and a sunrise service at Point Park this morning — every service has been a beautiful time of reflection. The final plague would be the death of all firstborns. I imagine there was little doubt as to whether this plague would actually occur. You can read the Scriptures beginning in Exodus 7 and see what everyone in Egypt would have witnessed through the first nine plagues. Then comes this final plague: the death of the firstborn. To avoid this terrible fate you would need to take a lamb into your home for 4-5 days, and then kill it, drain its blood and use it to mark the frame of your door. Only if the blood was there, would your house be passed over. Pastor Salter drew our attention to the emotions of waking up that next day. Can you stop for a minute and consider it? Can you imagine waking up that morning and being able to hug your firstborn? You’d be overcome with gratitude. The covering of the blood had saved your beloved child. I can picture myself sobbing and embracing my sweet Dub, and knowing that he lived only because the sweet perfect lamb had died. That is not just the story of Passover. It is the truth of Easter. Worthy is the lamb that was slain for you and for me. Hope you have a fabulous day celebrating your Risen King!